We have never nor will we ever know any moment other than this moment. It is eternity. Tomorrow is not here, it is not reality. Yesterday, or even five minutes ago, does not exist. The experiences of the past are memories: thoughts from which you can choose your focus and learn. All of life’s stresses come from regrets over the past and concerns over the future which do not exist in this moment: and it is always this moment. The excerpt above is from my post, Living in the Moment. When we set goals for the future and draw motivation from these goals, it is important not to suspend our happiness until a goal is complete. We can enjoy planning and fantasizing the realization of our goals. We can enjoy watching the progress, moving in the desired direction and celebrating milestones as yesterday’s post, Celebrating Milestones, suggests. No matter what we accomplish in life, there will always be more to accomplish. When one project is complete, another will take its place. Even spiritual milestones are followed by continued spiritual growth toward another milestone. It is easy to spend all of our days looking forward to the next day and missing today. 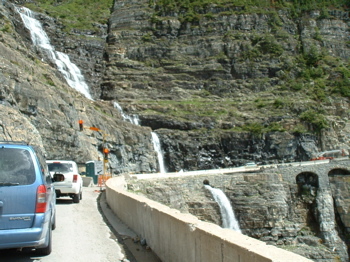 A stoplight controlling construction traffic on Going-to-the-Sun road in Glacier National Park, Montana. It wasn’t hard to enjoy this journey. Most of us will spend most of our time working toward goals and very little time reveling in their completion. If happiness and enjoyment are reserved for the completions, most of life will be lived in unhappiness. Motivation can not be sustained very long without joy. Don’t wait for joy to come in the end. Find it now. Find it in the small tasks you complete every minute, in the progress you see, in your abilities, in the lessons you learn along the way, in the people around you and in every moment you’re alive. This post is part 6 of a series: Motivation to Complete Your Goals.